This is our own mulch, consisting of pine, hemlock, cedar and hardwood. It is approaching three years old and the color is 100% natural composting (no dye). It has a pH of 7.0 that translates into the perfect pH for your soil as it decomposes. Regularly $35 per yard, but if you pay cash and pick it up yourself (we load you with our machine), there's a $5 per yard discount. Please no teeny tiny pickup trucks. This is our delivery truck for bulk mulch and soil. It holds a lot, so let us know what you need and we'll give you a quote for delivery. figure your square footage in feet. Add up all the areas. 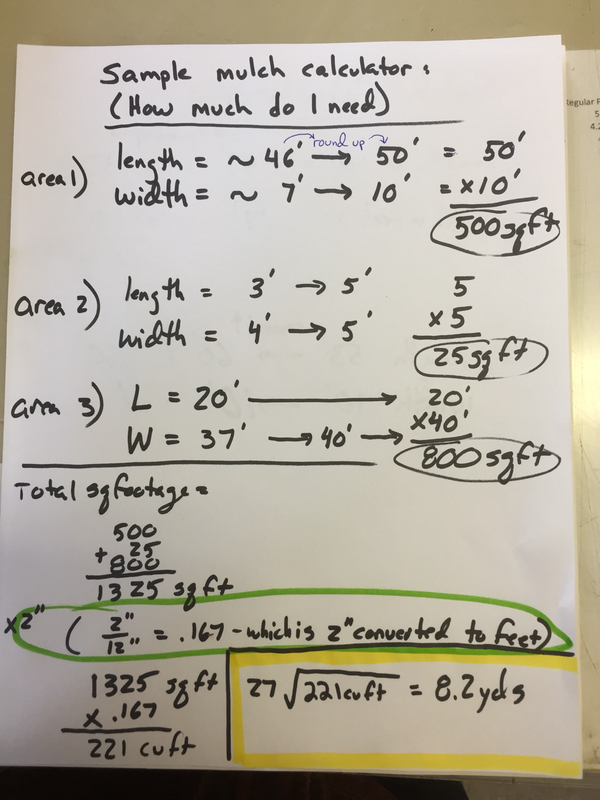 Multiply by .167 (that's 2"-the depth in feet for yearly applications). If you don't put it on every year, put it on three inches deep (.25). the resulting number is total cubic feet. Divide that by 27. The end result is the approx number of yards you need. Round numbers up each computation so you aren't short two wheelbarrows. You can come in and pick up mulch here by the yard, you can have your landscaper come get it, or you can have us deliver it to your house. We charge normal prices for mulch deliveries plus a delivery charge plus tax. With most mulches we sell we offer a slight discount when you pick it up, and with our "Wakeman Mulch" we usually offer a "Cash Price" (there is still tax on cash sales). Pictured above is our "Wakeman Mulch" which is 100% natural, undyed, fine particle size made up of pine/hemlock/cedar/hardwood. It has a pH of 7.0 that makes it perfect for gardens and flower beds especially after it decomposes down into more of a "humusy" soil amendment. 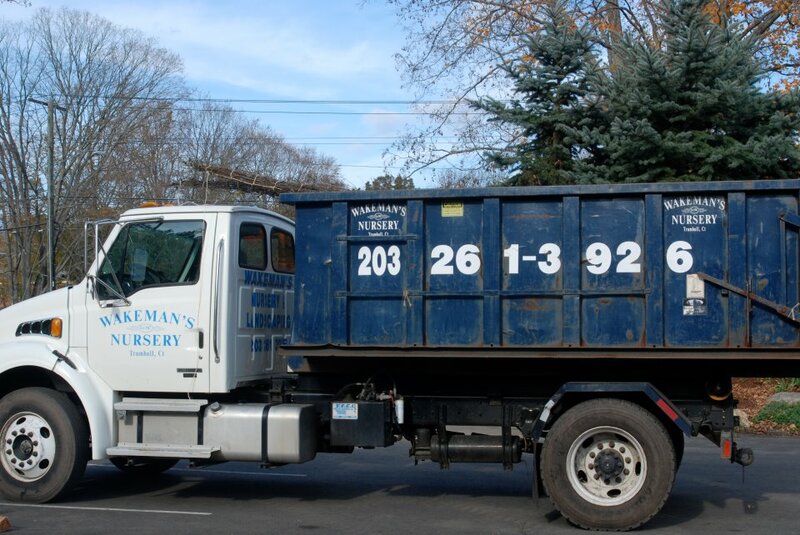 We offer Wakeman mulch in an aged form also and use this aged mulch as our nursery potting soil as well as an amendment for the "Fluffy garden soil" that we sell. 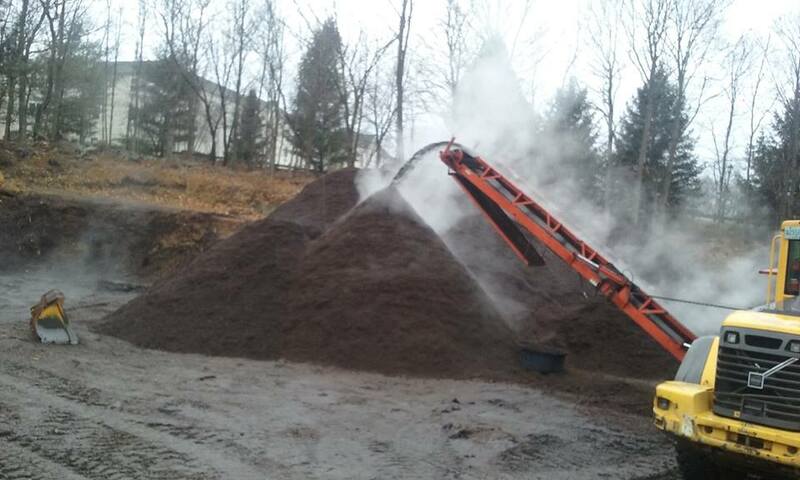 When the aged mulch is added to topsoil during the screening process, the result is a spongy material that roots thrive in. The tiny bits of undecomposed wood mulch continue to be eaten by the microbes which gives the soil LIFE. This biological activity makes relationships between plants and soil more active than anything else you can do for your plants.